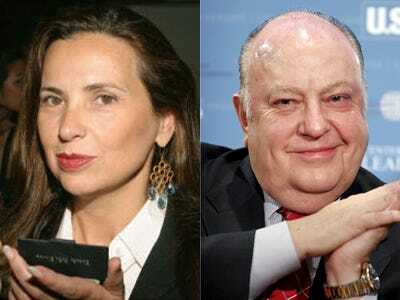 The NYT is reporting that Judith Regan, the former publishing powerhouse, says that in 2006 Roger Ailes encouraged her to lie to federal investigators about her affair with former NYC police chief Bernie Kerik in an effort to protect Rudy Giuliani‘s upcoming presidential bid. And she supposedly recorded it. At the time federal investigators were vetting Kerik become secretary of Homeland Security (on Giuliani’s recommendation). Regan, you may recall, was unceremoniously fired from her job at Harper Collins (owned by News Corp) and in the subsequent lawsuit against them revealed that a “senior executive” at News Corp has asked her to lie, but wouldn’t name names. And still hasn’t, it should be noted. The Ailes reveal came yesterday when affidavits filed in a separate lawsuit revealed the exec was Ailes himself. Alas, “no transcript of the conversation is included in the court records” though lord knows Media Matters is going to devote every resource they have to finding one. If it were to become public, the tape could be highly embarrassing to Mr. Ailes, a onetime adviser to Richard Nixon whom critics deride as a partisan who engineers Fox News coverage to advance Republicans and damage Democrats, something Fox has long denied. Mr. Ailes also had close ties with Mr. Giuliani, whom he advised in his first mayoral race. Mr. Giuliani officiated at Mr. Ailes’s wedding and intervened on his behalf when the Fox News Channel was blocked from securing a cable station in the city. 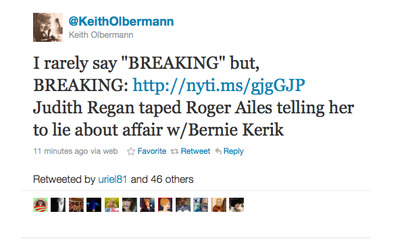 Read the NYT piece here…the NYPost cover tomorrow will be interesting, Regan was a favourite cover subject of theirs back in the day but the Ailes connection will obviously make it tricky business.